Since Spring is finally here, I felt inclined to put another "wardrobe staples" post together. You may remember my previous wardrobe staples post last seen here. I love keeping my outfits simple and all of the items and accessories below are classics in my opinion. I've always loved the clean look of denim cut offs worn with an oversized sweater, straw tote and flip flops. Aviator glasses, bright pink nails and sparkly stud earrings are the perfect minimalist-chic accessories. Now if I can only get my hands on that Joie sweater and Alice and Olivia floral skirt I'll be set! What are your Spring must haves? Love hat & floral skirt. Great list, all so pretty. These are are such pretty spring items! I love that Farmer's Market tote... adorable. Hope you have a great weekend, Audrey! That floral skirt is so cute! I'm pretty sure my jean jacket that I wore in HS is still at my parents' house...I need to see if I can dig it up! I love your spring picks so much!! They are perfectly chic & casual! Can you believe I don't own a pair of denim cut offs? I LOVE the idea of them with an oversized sweater though, or a loose fitting blouse! Might just have to find myself a pair! The skirt, hat & nail polish here make me giddy for warm days! Happy Friday gorgeous! Have a great weekend! Nice picks! I love the sweater and am in need of some new denim shorts! Some awesome pics... The selection is getting me excited for my trip to Cabo. Excellent inspiration. I adore florals! That skirt is calling my name! Oooh, definitely great essentials! I just bought a fedora that I'm excited to wear haha. A spring essential for me is bright nail polish too! really great selection for Spring ! 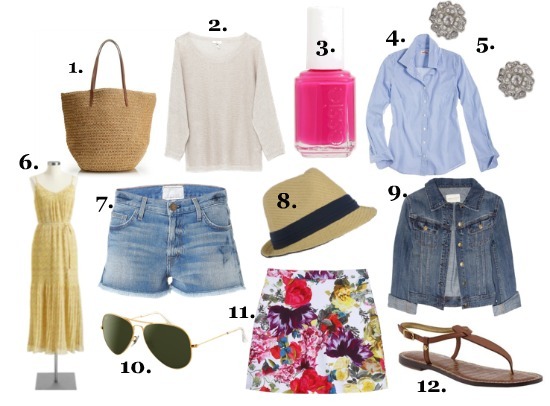 I love the floral skirt and the J.Crew blue shirt ! I'm ready for Spring !!! Love the floral skirt! Great picks! Going to buy that Old Navy dress when I get a chance. Love it. Such great pieces, I love them all. Lovely pieces. They would work with anything! You always look so put together and sophisticated! How do you do it?! Love this look!